In D Major. Composed by Carl Philipp Stamitz. Sheet music with CD. Music Minus One. Classical. Edition with Play-Along. Op.1. Music Minus One #MMO4528. Published by Music Minus One (HL.400772). ISBN 9781596158177. 9x12 inches. English. 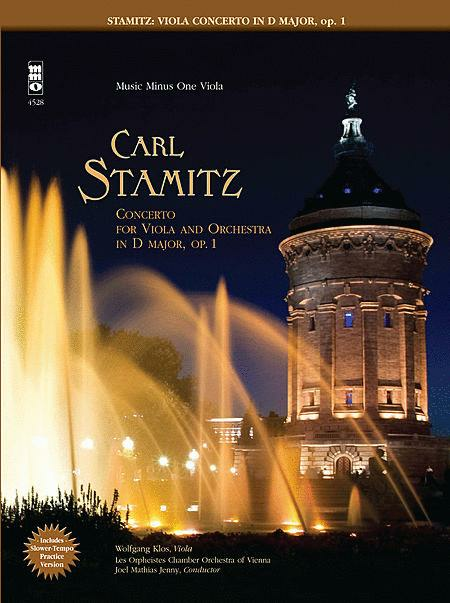 Carl Stamitz, one of the great musicians to emerge from the Mannheim school, is well known for a wide variety of compositions from concerti to chamber works. This gorgeous viola concerto, long a standard learning tool in the world's great conservatories, exhibits a deep and beautiful musical quality that has made this a standard among viola works with orchestra; and is finally available in an MMO play-along with the brilliant ensemble Les Orpheistes Chamber Orchestra of Vienna. The viola part sparkles and provides a rich training ground on which to finely home your skills, with the advantage of a full, lush orchestra at your side! You will love this marvelous piece, which represents Stamitz's bridging of the Baroque and Classical eras. Includes slow-tempo practice accompaniments of the faster outer movements.